Details on Amazing Synthesis Abilities, Powerful New Items and Content-Packed DLC Await. The game will launch on the 20th January 2017 digitally for the PlayStation Vita handheld entertainment system, and in a physical Collector’s Edition. Atelier Shallie Plus: Alchemists of the Dusk Sea features a Synthesis system which allows players to craft more efficient items using ‘Synthesis Skills’. These abilities can be utilised by adding certain materials to the cauldron which can bestow a variety of effects upon the final item, such as granting extra uses or increasing the resulting effect. All materials fall under one of four elemental attributes: fire, water, wind and earth. When combined successfully, these elements can activate a ‘Chain’ which further enhances items, resulting in bonuses stronger than those obtained through executing standard synthesis. 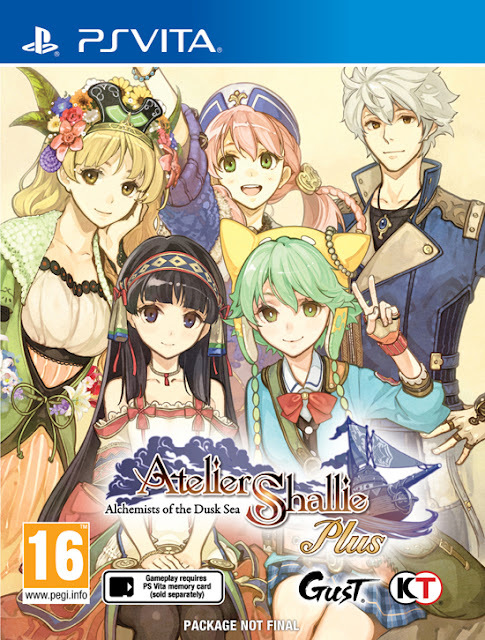 Atelier Shallie Plus: Alchemists of the Dusk Sea contains a myriad of brand new costumes designed specifically for the Plus version of Atelier Shallie, ensuring that any Alchemist can craft their own unique style. Players can choose from the Crimson Guard, Grand Pirate Dress, Lady Villain and Cobalt Saber costumes to dress up their team, along with having access to all of the downloadable content originally released for the PlayStation 3 version of the game. Packed with brand new content and plenty of new secrets to uncover, Atelier Shallie Plus: Alchemists of the Dusk Sea is the upcoming portable Plus version of 2015’s Atelier Shallie: Alchemists of the Dusk Sea, previously exclusive to the PlayStation®3 computer entertainment system. The game tells the tale of Shallistera, the daughter of a tribal leader who embarks on a voyage to find a solution to the drought affecting her homeland, and Shallotte, a struggling alchemist who dreams of “hitting it big.” Both are joined by a diverse cast of characters who will help them throughout their journey around the world of Dusk. Players will encounter the quick-thinking Kortes, Shallistera’s childhood friend and bodyguard, Wilbell voll Erslied, a grand magician in training, Jurie Crotze, a lone-wolf treasure hunter, and Miruca Crotze, a childhood friend of Shallotte’s who works as a blacksmith.